A comprehensive, step-by-step guide - complete with real examples - on writing a business plan with just the right amount of panache to catch an investor's attention and serve as a guiding star for your business. 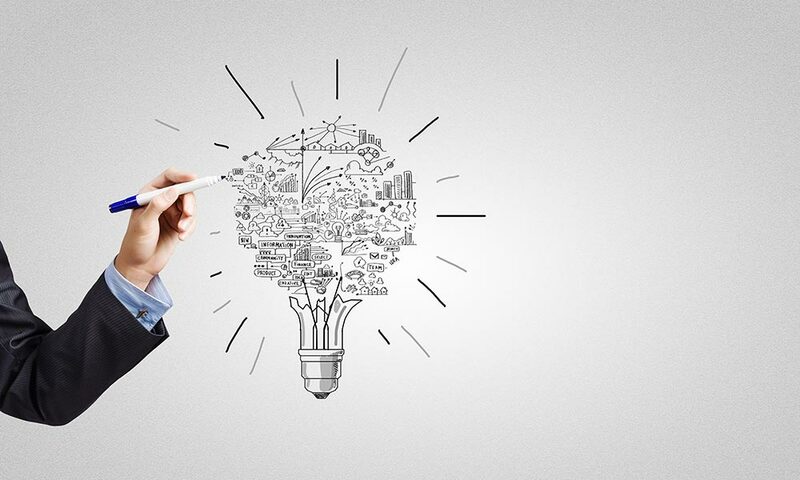 So you’ve got a killer startup idea. Now you need to write an equally killer business plan. You fire up your computer, open a Google doc, and stare at the blank page for several minutes before it suddenly dawns on you that, Hm…maybe I have no idea how to write a business plan from scratch after all. And you certainly wouldn’t be the first! For most founders, writing a business plan feels like the startup equivalent of homework. It’s the thing you know you have to do, but nobody actually wants to do. Here’s the good news: writing your business plan doesn’t have to be this daunting, cumbersome chore. Once you understand the fundamental questions that your business plan should answer for your readers and how to position everything in a way that compels your them to take action, writing it becomes way more approachable. Before you set fingers to the keyboard, we’re going to walk you through the most important things to keep in mind to help you tackle the writing process confidently — with plenty of real life business plan examples along the way! There’s this oldschool idea that business plans need to be ultra-dense, complex documents the size of a doorstop because that’s how you convey how serious you are about your company. Complexity and length for complexity and length’s sake is almost never a good idea, especially when it comes to writing a business plan. There are a couple of reasons for this. If your chief goal is using your business plan to secure investment capital, then it means you intend on getting it in front of an investor. And if there’s one thing investors are, it’s busy. Investors wade through hundreds of plans a year. There’s no version of you presenting an 80-page business plan to an investor and they enthusiastically dive in and take hours out of their day to pore over the thing front to back. Instead, they’re looking for you to get your point across as quickly and clearly as possible so they can skim your plan and get to the most salient parts to determine whether or not they think your opportunity is worth pursuing (or at the very least initiating further discussions). You should be able to refine all of the key value points that investors look for to 15-20 pages (not including appendices where you will detail your financials). If you find yourself writing beyond that, then it’s probably a case of either over explaining, repeating information, or including irrelevant details (you don’t need to devote 10 pages to how you’re going to set up your website, for example). If you fill your business plan with buzzwords, industry-specific jargon or acronyms, and long complicated sentences, it might make sense to a handful of people familiar with your niche and those with superhuman attention spans (not many), but it alienates the vast majority of readers who aren’t experts in your particular industry. Your best bet here is to use simple, straightforward language that’s easily understood by anyone — from the most savvy of investor to your Great Aunt Bertha who still uses a landline. You might be a prodigy in quantum mechanics, but if you show up to your interview rocking cargo shorts and lime green Crocs, you can probably guess what the hiring manager is going to notice first. In the same way, how you present your business plan to your readers equally as important as what you present to them. if your business plan is laden with inconsistent margins, multiple font types and sizes, missing headings and page numbers, and lacks a table of contents, it’s going to create a far less digestible reading experience. While there’s no one right way to format your plan, the idea here is to ensure that it presents professionally. Here’s some easy formatting tips to help you do just that. If your margins are too narrow, it makes the page look super cluttered and more difficult to read. A good rule of thumb is sticking to standard one-inch margins all around. Your business plan is made up of several key sections, like chapters in a book. Whenever you begin a section (“Traction”, for example) you’ll want to signify it using a header so that your reader immediately knows what to expect from the content that follows. This also helps break up your content and keep everything nice and organized. Subheadings are mini versions of headings meant to break up content within each individual section and capture the attention of your readers to keep them moving down the page. In fact, we’re using subheaders right now in this section for that very purpose! Limit your plan to two typefaces (one for headings and one for body copy and subheadings, for example) that you can find in a standard text editor like Microsoft Word or Google Docs. Only pick fonts that are easy to read and contain both capital and lowercase letters. Avoid script-style or jarring fonts that distract from the actual content. Modern, sans-serif fonts like Helvetica, Arial, and Proxima Nova are a good way to go. Keep your body copy between 11 and 12-point font size to ensure readability (some fonts are more squint-inducing than others). You can offset your headings from your body copy by simply upping the font size and by bolding your subheadings. Sometimes it’s better to show instead of just tell. Assume that your readers are going to skim your plan rather than read it word-for-word and treat it as an opportunity to grab their attention with color graphics, tables, and charts (especially with financial forecasts), as well as product images, if applicable. This will also help your reader better visualize what your business is all about. Our business planning wizard comes pre-loaded with modular sections that you can complete in any order and makes it ridiculously easy to generate any financial report you could possibly ever need. Refine. Then Refine Some More. Your business isn’t static, so why should your business plan be? A good business plan is always evolving, and every last detail is rarely ever set in stone. This means that the first version of your plan probably won’t (and shouldn’t be) your last. As your business progresses and your ideas about it shift, it’s important revisit your business plan from time to time to make sure it reflects those changes, keeping everything as accurate and up-to-date as possible. This rule especially holds true when you go about your market research and learn something that goes against your initial assumptions. At the same time, before you begin shopping your business plan around to investors or bankers, it’s imperative to get a second pair of eyes on it after you’ve put the final period on your first draft. After you run your spell check, have someone with strong “English teacher skills” run a fine-tooth comb over your plan for any spelling, punctuation, and grammatical errors you may have glossed over. More than that, your trusty business plan critic can also give you valuable feedback on how it reads from a stylistic perspective. While different investors prefer different styles, the key here is to remain consistent with your audience and business. We devoted an entire article carefully breaking down the key components of a business plan which takes a comprehensive look of what each section entails and why. If you haven’t already, you should check that out, as it will act as the perfect companion piece to what we’re about to dive into in a moment. 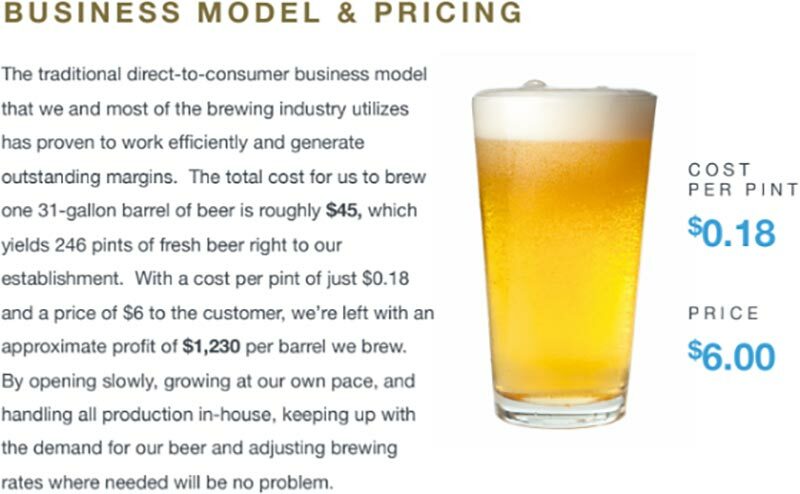 For our purposes here, we’re going to look at a few real world business plan examples (as well as one of our own self-penned “dummy” plans) to give you an inside look at how to position key information on a section-by-section basis. After your Title Page — which includes your company name, slogan (if applicable), and contact information — and your Table of Contents, the Executive Summary will be the first section of actual content about your business. The primary goal of your Executive Summary is to provide your readers with a high level overview of your business plan as a whole by summarizing the most important aspects in a few short sentences. Think of your Executive Summary as a kind of “teaser” for the information to follow — information which you will explain in greater detail throughout your plan. 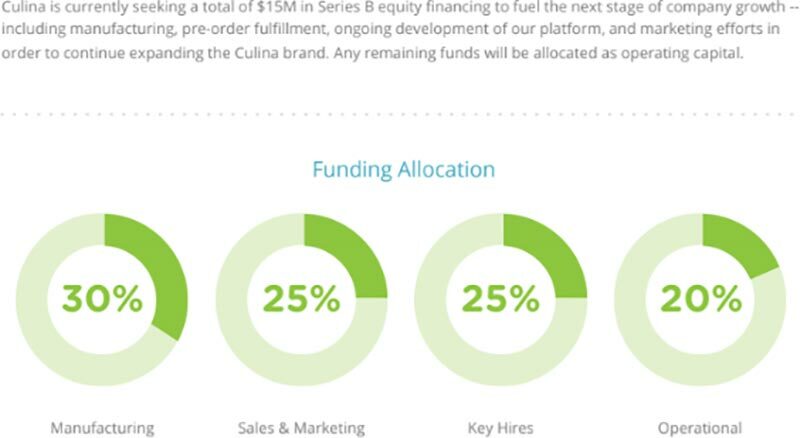 Here’s an example taken from a sample business plan written by the Startups.co team for a fictional company called Culina. Here, we’ll see how the Executive Summary offers brief overviews of the Product, Market Opportunity, Traction, and Next Steps. Culina Tech specializes in home automation and IoT technology products designed to create the ultimate smart kitchen for modern homeowners. Our flagship product, the Culina Smart Plug, enables users to make any kitchen appliance or cooking device intelligent. 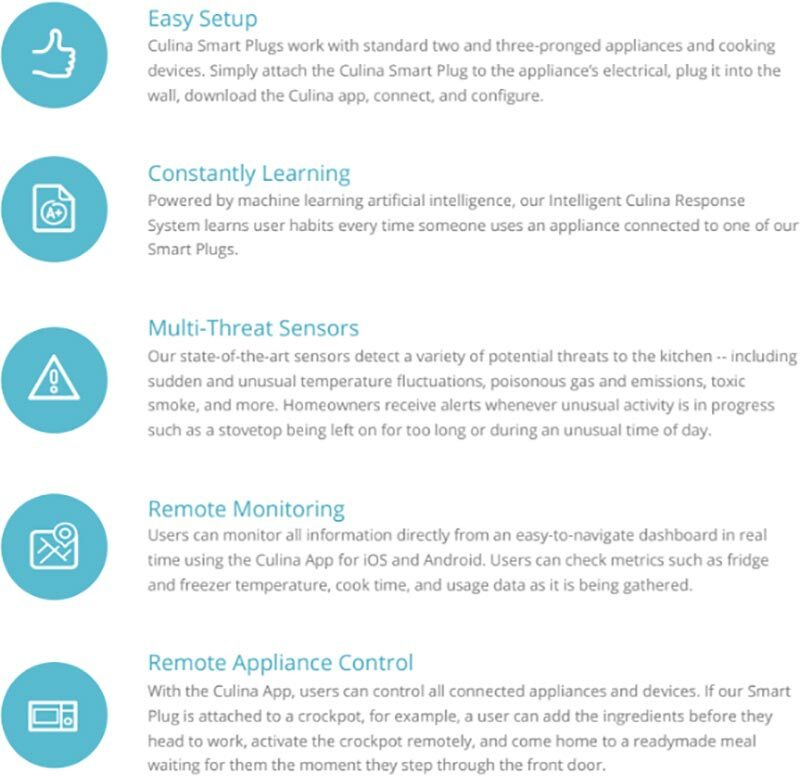 Compatible with all existing brands that plug into standard two or three-prong wall outlets, Culina creates an entire network of Wi-Fi-connected kitchen devices that can be controlled and monitored remotely right from your smartphone. The majority of US households now spend roughly 35% of their energy consumption on appliances, electronics, and lighting. With the ability to set energy usage caps on a daily, weekly or monthly basis, Culina helps homeowners stay within their monthly utility budget through more efficient use of the dishwasher, refrigerator, freezer, stove, and other common kitchen appliances. Additionally, 50.8% of house fires are caused in the kitchen — more than any other room in the home — translating to over $5 billion in property damage costs per year. Culina provides the preventative intelligence necessary to dramatically reduce kitchen-related disasters and their associated costs and risk of personal harm. Our team has already completed the product development and design phase, and we are now ready to begin mass manufacturing. We’ve also gained a major foothold among consumers and investors alike, with 10,000 pre-ordered units sold and $5 million in investment capital secured to date. We’re currently seeking a $15M Series B capital investment that will give us the financial flexibility to ramp up hardware manufacturing, improve software UX and UI, expand our sales and marketing efforts, and fulfill pre-orders in time for the 2018 holiday season. Your Company Synopsis section answers two critically important questions for your readers: What painful PROBLEM are you solving for your customers? And what is your elegant SOLUTION to that problem? 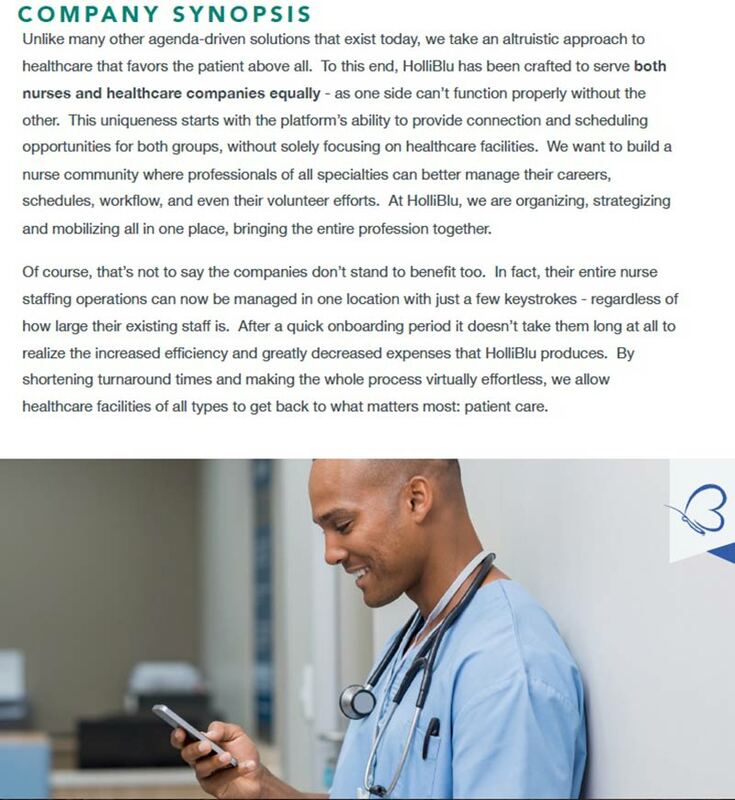 Notice how we get a crystal clear understanding of why the company exists to begin with when they set up the problem — that traditional nurse recruitment methods are costly, inconvenient, and time-consuming, creating significant barriers to providing quality nursing to patients in need. 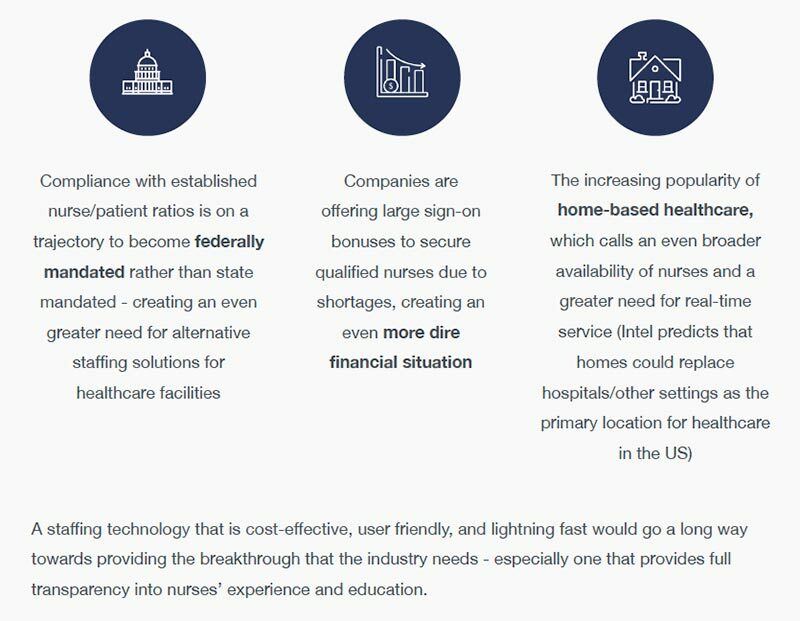 Once we understand the painful problem that HolliBlu’s customers face, we’re then directly told how their solution links back directly to that problem — by creating an entire community of qualified nurses and directly connecting them with local employers more cost-effectively and more efficiently than traditional methods. Your Market Overview provides color around the industry that you will be competing in as it relates to your product/service. This will include statistics about industry size, growth rate, trends, and overall outlook. If this part of your business plan can be summed up in one word, it’s research. This is a market big enough to get excited about. You can capture a big enough share of this market to get excited about. 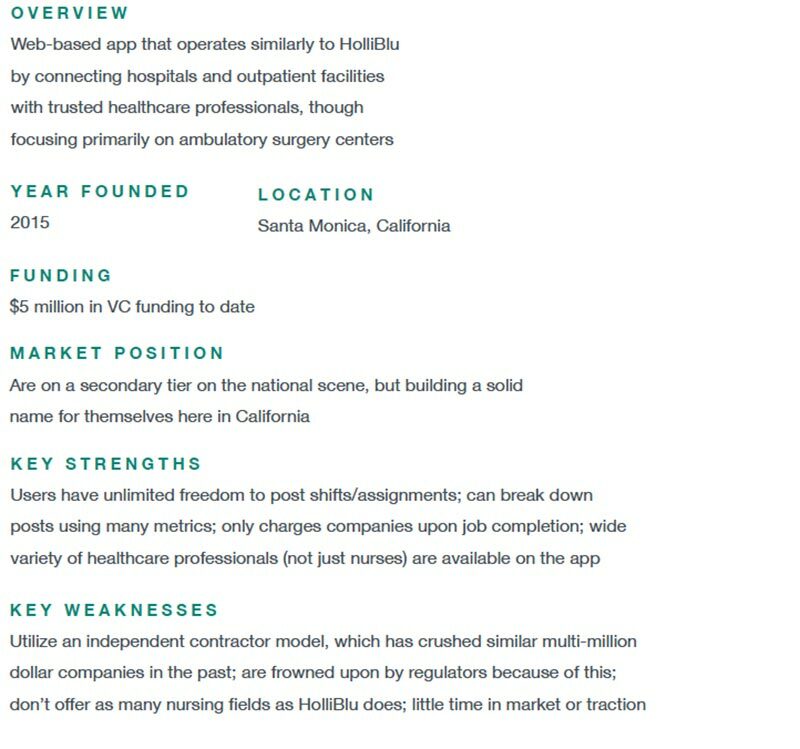 HolliBlu’s Market Overview hits all of the marks — clearly laying out the industry size ($74.8 billion), the Total Addressable Market or TAM (3 million registered nurses), industry growth rate (581,500 new RN jobs through 2018; $355 billion by 2020), and industry trends (movement toward federally-mandated compliance with nurse/patient ratios, companies offering sign-on bonuses to secure qualified nurses, increasing popularity of home-based healthcare). Where your Company Synopsis is meant to shed light on why the company exists by demonstrating the problem you’re setting out to solve and then bolstering that with an impactful solution, your Product or How it Works section allows you to get into the nitty gritty of how it actually delivers that value. In the below example from our team’s Culina sample plan, we’ve divided the section up using subheadings to call attention to product’s key features and how it actually works from a user perspective. This approach is particularly effective if your product or service has several unique features that you want to highlight. Quite simply, your Revenue Model gives your readers a framework for how you plan on making money. It identifies which revenue channels you’re leveraging, how you’re pricing your product or service, and why. It can be easy to get hung up on the financial aspect here, especially if you haven’t fully developed your product yet. And that’s okay. 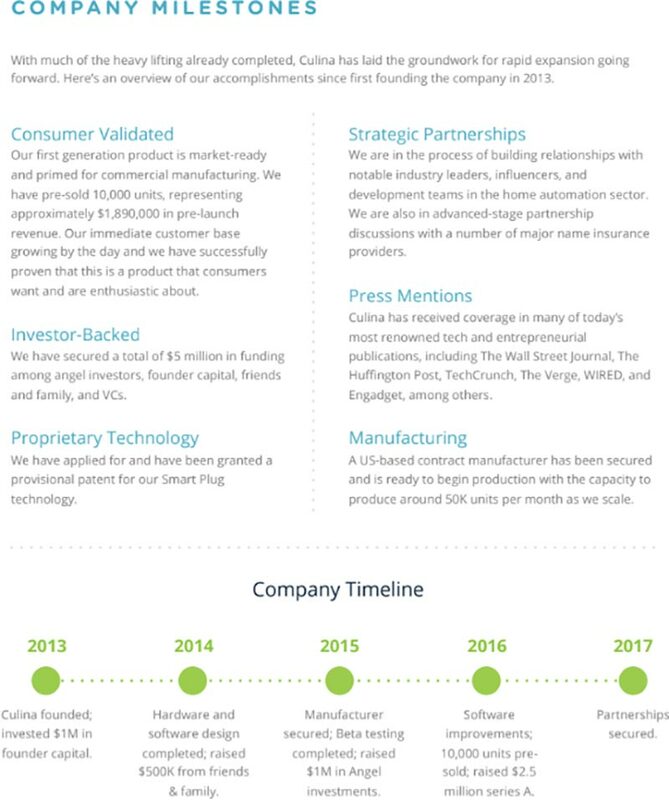 *Note: Full disclosure; Our team worked directly with this company on their business plan via Fundable. The thing to remember is that investors will want to see that you’ve at least made some basic assumptions about your monetization strategy. Your Operating Model quite simply refers to how your company actually runs itself. It’s the detailed breakdown of the processes, technologies, and physical requirements (assets) that allow you to deliver the value to your customers that your product or service promises. The equipment you need to purchase (coffee and espresso machines, appliances, shelving and storage, etc.) and their respective costs. The inventory you plan to order regularly (product, supplies, etc. ), how you plan to order it (an online supplier) and how often it gets delivered (Mon-Fri). that show how your Critical Costs might fluctuate over time. that highlight strategic uses of capital that will have a big Return on Investment (ROI) later. explaining your capability of delivering your product or service in the most cost effective manner possible while maintaining the highest standards of quality. Like the Market Overview section, your Competitive Analysis shows your readers that you’ve done your homework and have a crazy high level of awareness about your current competitors or any potential competitors that may crop up down the line. When writing your Competitive Analysis, your overview should cover who your closest competitors are, the chief strengths they bring to the table, and their biggest weaknesses. You’ll want to identify at least 3 competitors — either direct, indirect, or a combination of the two. Your Customer Definition section allows you to note which customer segment(s) you’re going after, what characteristics and habits each customer segment embodies, how each segment uniquely benefits from your product or service, and how all of this ties together to create the ideal portrait of an actual paying customer. HolliBlu’s Customer Definition section is effective for several reasons. 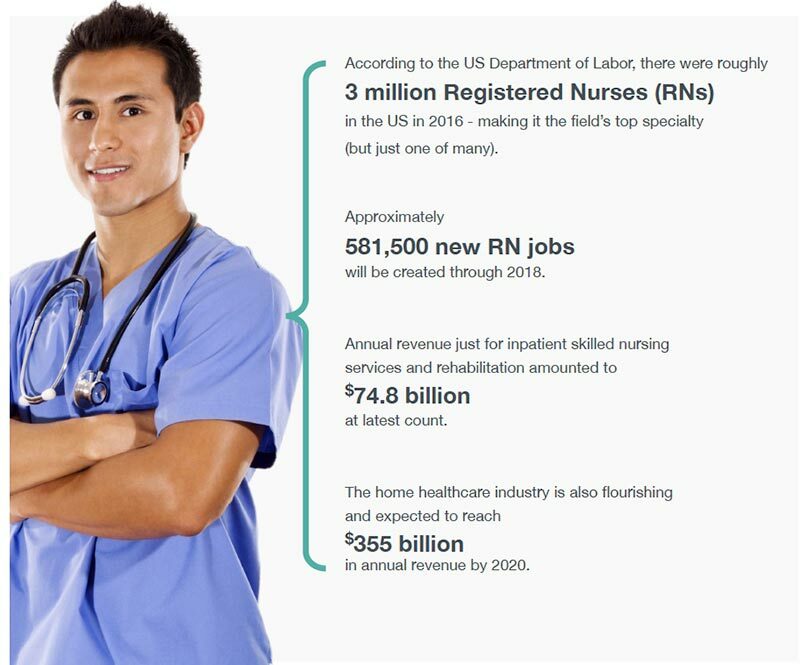 Let’s deconstruct their first target customer segment, hospitals. 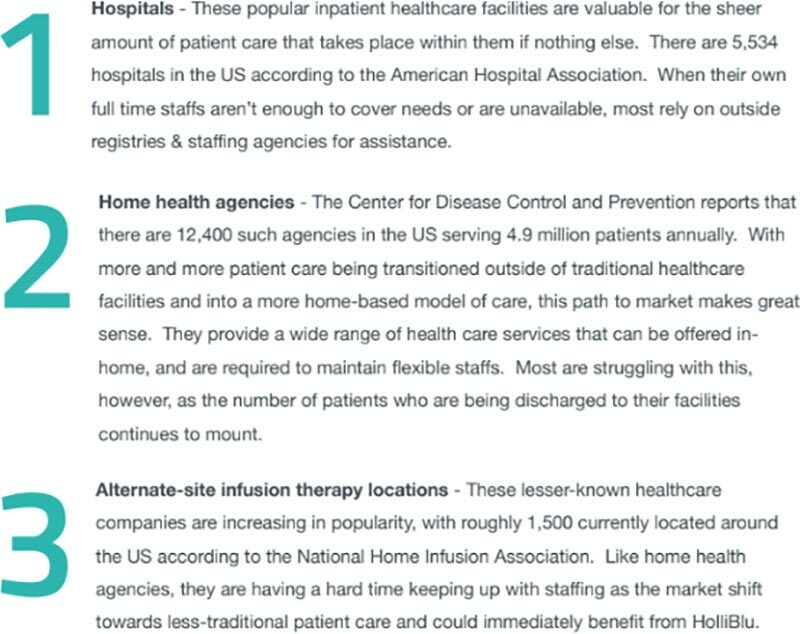 What’s particularly successful here is that we are explained why hospitals are optimal buyers. They accomplish this by harkening back to the central problem at the core of the opportunity (when hospitals can’t supply enough staff to meet patient demands, they have to resort on costly staffing agencies). On top of that, we are also told how big of an opportunity going after this customer segment represents (5,534 hospitals in the US). This template is followed for each of the company’s 3 core customer segments. This provides consistency, but more than that, it emphasizes how diligent research reinforces their assumptions about who their customers are and why they’d open their wallets. Now that you’ve defined who your customers are for your readers, your Customer Acquisition section will tell them which strategies and tactics you plan to leverage to actually reach those customers and ultimately convert them into paying customers. Similar to the exercise you will go through with your Revenue Model, in addition to identifying which channels you’re pursuing, you’ll also want to detail all of relevant costs associated with your customer acquisition channels. Let’s say you spent $100 on your marketing efforts to acquire 100 customers during 2018. To get your CAC, you simply divide the number of customers acquired by your spend, giving you a $1.00 CAC. This one’s huge. Traction tells investors one important thing: that you’re business has momentum. It’s evidence that you’re making forward progress and hitting milestones. That things are happening. Why is this so important? Because if you can prove to investors that your company’s got legs before they’ve even put a dime into it, then it will get them thinking about all the great things you’ll be able to accomplish when they do bankroll you. In our Culina Traction section, we’ve called attention to several forms of traction, touching on some of the biggest ones that you’ll want to consider when writing your own plan. Have I built or launched my product or service yet? Have I reached any customers yet? Have I generated any revenue yet? Have I forged any strategic industry relationships that will be instrumental in driving growth? The key takeaway here: the more traction you can show, the more credibility you build with investors. Here’s what your Management Team section isn’t: it’s not an exhaustive rundown of each and every position your team members have held over the course of their lives. Instead, your Management Team section should tell investors which aspects of your team’s experience and expertise directly translates to the success of this company and this industry. In other words, what applicable, relevant background do they bring to the table? Let’s be real. 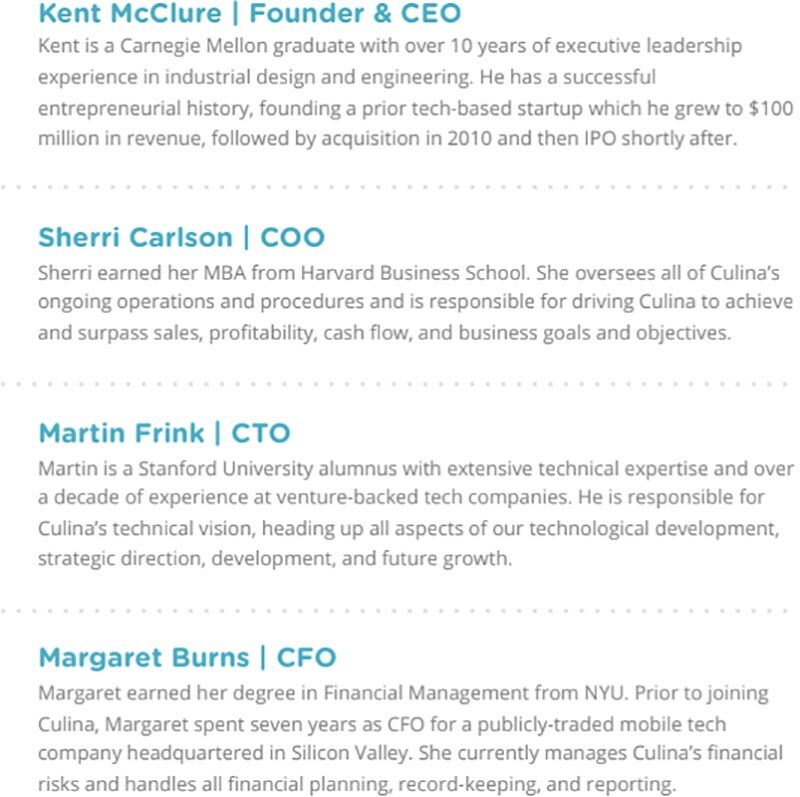 The vast majority of startup teams probably aren’t stacked with Harvard and Stanford grads. But the thing to home in on is how the prior experience listed speaks directly to how it qualifies that team member’s current position. The word of the day here is relevancy. If it’s not relevant, you probably don’t need to include it in your plan. The ask! This is where you come out and, you guessed it, ask your investors point blank how much money you need to move your business forward, what specific milestones their investment will allow you to reach, how you’ll allocate the capital you secure, and what the investor will get in exchange for their investment. You can also include information about your exit strategy (IPO, acquisition, merger?). Spreadsheets and numbers and charts, oh my! Yes, it’s everybody’s “favorite” business plan section: Financials. Your Financials section will come last and contain all of the forecasted numbers that say to investors that this is a sound investment. This will include things like your sales forecast, expense budget, and break-even analysis. A lot of this will be assumptions, or estimates. The key here is keeping those estimates as realistic as humanly possible by breaking your figures into components and looking at each one individually. 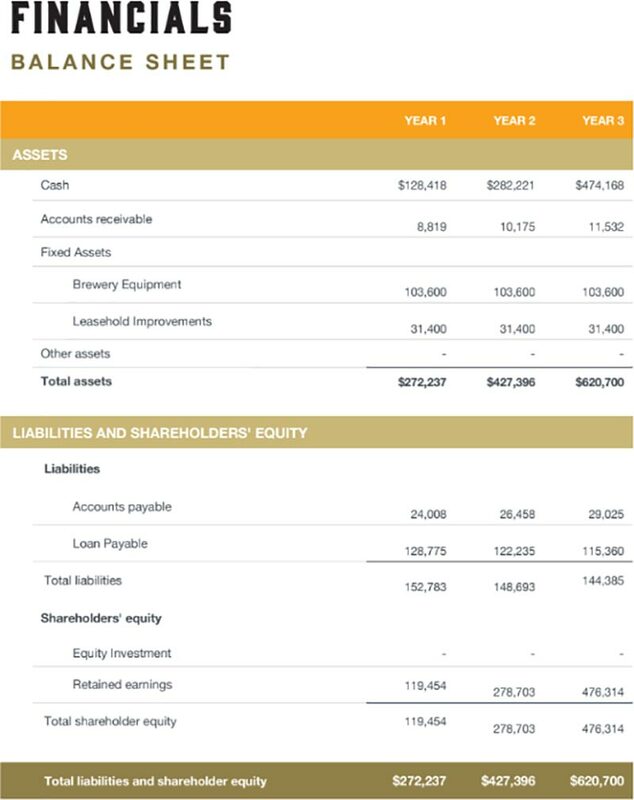 The balance sheet above illustrates the business’ estimated net worth over a three-year period by summarizing its assets (tangible objects owned by the company), liabilities (debt owed to a creditor of the company), and shareholders’ equity (source of financing used to fund the assets). In plain words, the balance sheet is basically a snapshot of your business’ financial status by laying out what you own and owe, helping investors determine the level of risk involved. If you’re looking to up your game from those outdated Excel-style spreadsheets, our business planning software will help you create clean, sleek, modern financial reports the modern way. Plus, it’s as easy to use as it is attractive to look at. You’ve committed to writing your business plan and now you’ve got some tricks of the trade to help you out along the way. Whether you’re applying for a loan or seeking investors, your well-crafted business plan will act as your Holy Grail in helping take your business to the next plateau. This is a ton of work. We’ve been there before. Writing your business plan is just one small step in startup journey. There’s a whole long road ahead of you filled investor outreach, actually getting funded, and growing your business. And guess what? We’ve got helpful information on all of it — and all at your disposal!